Maybe you're familiar with the concept of Slow TV? Norwegian in origin, it began with a live feed of a multi-hour train journey. When that got the viewers hooked, they did a trip around the fjords, a wood fire -- contentious because of the different methods used to stack the logs -- and hours & hours of knitting. All live. All that came to mind thanks to distant memories of One Man And His Dog. I should probably pitch the idea of live sheep-herding to Emil, Elias and Erik over there in Oslo. Which leads us to today's place of eats, a long-lived landmark on the old Felixstowe Road, the Shepherd & Dog. 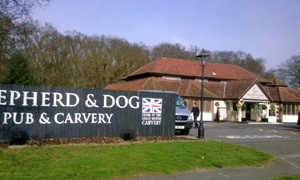 Yes, it's a pub slash carvery, but we're all a tad pushed for time and need somewhere new yet near-ish. Collectable facts include (a) me driving and (b) Defiants backbone Kev coming along too. Note that e're almost directly opposite the track that we took to the Orwell Crossing way back when. Wait here to be seated, says the sign. Looks busy in that carvery area so we'll order at the bar, then head outside. Drinks, first: tasty Grapetise for me and, to ensure a productive afternoon, an Adnams for Kev. No great views to be had out there, nor kids' playground. Simply good to be out in the warmth of the spring sunshine. And here, regular as an unwound watch, is Andy, very shortly followed by his food selection, a slab of millionaire shortbread cheesecake. He's evidently had a tough morning up the road in Trinity Park. Thank goodness for our sensible savoury selections: stack of sweet potato chips for Kev -- such exotic tastes -- and a Club Carvery for me. My toasted sandwich is cut into four massive quarters, each a meal in itself, plus chips (standard potato) on the side. Not easy being a legit light luncher. Sarnie was a bit dry, if I'm honest, but there was ketchup. All in all, many food options to be had, affordable prices a la Mermaid, and mighty generous portion sizes. Enough to feed not just a shepherd but a butcher's dog too. If it was a car -- NSEwe Prinz. If they were passing by -- Mackenzie Crook.